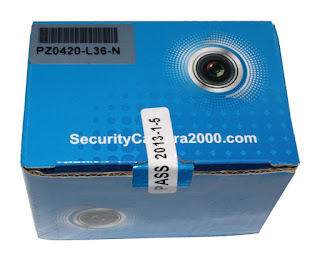 Only 19 left in stock of our second batch of PZ0420 600TVL Color Board Cams, the most popular FPV camera from SecurityCamera2000.com with a DIY filter kit included so you can run your camera and video transmitter off your 3S LiPo without needing a separate battery. Referring to several questions we received on this, in the existing power lead, the center pin on the power jack is positive, and goes to the red wire on the board-side connector. The outside is negative and connects to the black wire on the connector. You can verify this for yourself with your multimeter in resistance or diode test mode. 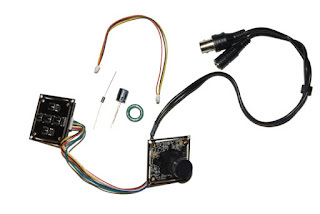 However, pretty much everyone using this for FPV just cuts off the existing big bulky connectors and solders a small RC extension cable on instead. That saves weight. When making your cable, wrap the RC extension through the ferrite ring five times around, connect the red wires through the diode (make sure the polarity is correct), and connect the capacitor across the red and black wires (again make sure the polarity is correct). Also, make sure you use the kind of RC extension cable that can only be plugged in one way, because reverse polarity power will fry the camera. The diode only works to filter voltage spikes and to drop the voltage from 12.6 volts down to about 12, not as reverse polarity protection. Considering Changing The Default 3.6MM Lens? Consider changing the default 3.6mm lens for a smaller, 2.8mm lens, primarily for learning purposes. However especially when flying at high speed near ground level and in proximity to obstacles, the default 3.6mm lens is a safer option, as the wide angle of a 2.8 mm lens makes small obstacles much harder to see, until they're so close that it may be too late.